HEJSupport directors participated in the third Open Ended Working Group (OEWG3) of SAICM, which took place from April 2-4 in Montevideo, Uruguay. The goal of the meeting is to develop recommendations for a future global regime on chemicals and waste beyond 2020 when the mandate of the current Strategic Approach to International Chemicals Management (SAICM) comes to the end. Delegates discuss Vision, Scope, Principles and Approaches of the future regime or SAICM 2.0 with the goal to develop a stronger and more ambitious strategy to address challenges of chemicals and waste. The Working Group discussed the future of the global regime on sound chemicals and waste management based on a paper by the Co-Chairs of the intersessional process on SAICM and the sound management of chemicals and waste beyond 2020. The Co-Chair’s Paper is divided into two sections: The first section contains introductory remarks by the Co-Chairs for participants in the third meeting of the Open-ended Working Group regarding background information and the context of the prepared document. The second section outlines a voluntary, multisectoral and multi-stakeholder agreement, proposed for consideration at the fifth session of the International Conference on Chemicals Management (ICCM5) based on the current Strategic Approach (SAICM) and taking into account the continuity of currently relevant effort. The second section of the paper consists of eight parts and an application; first, the main elements of ensuring the sound management of chemicals and waste after 2020 are considered: concept, scope, principles and approaches. The document presents 5 strategic objectives and 20 related objectives, which are considered applicable to both, the further implementation of the Strategic Approach after 2020 (the so-called “SAICM 2.0”) and to a more expanded framework. The following parts of the document examine the progress in achieving the stated goals from the point of view of institutional mechanisms, mechanisms for promoting their achievement and financial considerations. – creating a broader platform for the strategic management of chemicals and waste in the period after 2020 and the process of its formation based on existing elements. During the meeting, non-governmental organizations highlighted the idea of developing a broad, global strategy or an enabling framework that would cover both voluntary agreements (namely SAICM 2.0) and legally binding institutional mechanisms (namely, existing international and regional chemical conventions and protocols). This umbrella structure should also contain a mechanism for developing and incorporating new legally binding elements and mechanisms on priority chemical safety issues. According to many non-governmental organizations, it is necessary to develop criteria for the preparation of new legally binding agreements, based on initiatives from countries and other stakeholders. The decision to develop such criteria should be taken at the forthcoming Fifth International Conference on Chemicals Management (ICCM 5) in 2020 in Bonn. It is assumed that the criteria will allow to nominate for the development of legally binding agreements such important issues as, for example, highly hazardous pesticides or chemicals in products. All interested parties should have the right to nominate issues for new legally binding agreements and provide detailed grounds for nomination based on accepted criteria. Each new nomination for the preparation of a legally binding agreement must be accompanied by a description of the process of their implementation, including the expected sources of funding. The final decision to start developing new legally binding agreements on chemicals and waste should be made at ICCM5 sessions. While discussing questions on how to make SAICM 2.0 more effective, meeting participants stressed the importance of the legally binding preparation of national implementation plans for SAICM, together with the establishment of a periodic review system for reporting. The preparation of such plans in developing countries and countries with economies in transition should be funded by international funds and donor countries. It is assumed that every three years the states will prepare reports on the implementation of their action plans, and an independent expert group will evaluate them and offer recommendations. These reports could become the basis for evaluating the effectiveness of SAICM 2.0, along with an assessment of countries’ needs for funding, capacity building, technical assistance, etc. According to many countries, it is important to prepare uniform national action plans for all chemical agreements, both legally binding and voluntary. Such unified action plans will attract the attention of high-level officials and will provide greater funding for their implementation. In addition, integrated action plans will ensure better coordination between the ministries and departments involved, will facilitate the exchange of information between them and other stakeholders working on the sound management of chemicals and waste. The meeting participants also discussed financing for the sound management of chemicals and waste beyond 2020. Effective work requires adequate, sustainable and predictable funding. Non-governmental organizations noted that funding should include the internalization of chemical industry costs at the global level, to fully implement the polluter pays principle. A 0.1% levy on the chemical industry`s income would produce USD$5.8 billion per year for implementation of chemical safety measures and be consistent with Rio Principle 16. Some countries and organizations have advocated for a special fund for the implementation of SAICM 2.0, which will provide funding for smaller grants than GEF categories and is designed using lessons learned from the SAICM QSP program. It is important that such a fund provides funding opportunities to all interested stakeholders, including public organizations. The UNEP Special Program for the Financing of Chemicals and Waste, which is currently in operation, provides assistance only to governments, depriving public organizations of the opportunity to independently apply for grants on chemicals and waste. During the meeting, it was actively discussed which waste to include in the new agreement on chemicals and waste for the post-2020 period. Non-governmental organizations and many developing countries have stated that all waste should be considered as part of a holistic approach, given that in many cases waste associated with chemicals is included in unsorted solid waste and to avoid delaying the definition of waste. Some participants emphasized the importance of a life cycle approach to chemicals and waste management. Non-governmental organizations have noted the need to ensure that the industry demonstrates its commitment to ensuring chemical safety in practice and takes all necessary measures to prevent harm from chemicals throughout their life cycle. The industry should be responsible for the relevant costs and consequences in accordance with the extended producer responsibility principle and the “polluter pays” approach. 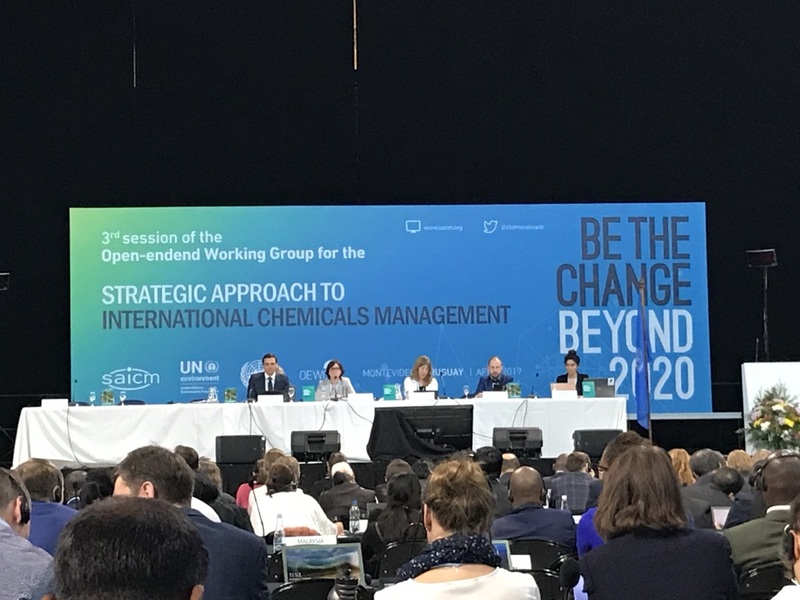 Following the discussion, it was decided to set up a contact group tasked with developing recommendations for SAICM 2.0 for consideration by the International Conference on Chemicals Management at its fifth session in 2020. Regarding the discussion on a broad platform for the strategic management of chemicals and waste beyond 2020, it was decided to hold informal consultations. The purpose of this information exchange is to understand whether there is a need for creating an intersectoral and integrated platform for the international sound management of chemicals and waste after 2020, and if so, what gaps could it address. Regarding the need for high-level political commitment to ensure the sound management of chemicals and waste, most country representatives supported the proposal to hold a ministerial conference in 2020 and adopt a corresponding declaration during the fifth session of the International Conference on Chemicals Management or during a high-level conference to be held immediately after this session. HEJSupport was able to speak in the plenary on a few topics as participating member of IPEN. Below are the two interventions. Thank you Madam President for giving us the floor. As a response to its ICCM committment, UNEP commissioned a series of reports on EDCs in 2016. These 3 very important reports on EDCs were finally released last year. Unfortunately, these long-awaited reports are not included in the meeting documents. As identified in the reports, EDCs are everywhere, but there is a lack of regulatory frameworks that address them, particularly in developing countries. With more than 1000 chemicals identified as EDCs or potential EDCs and estimated annual health cost of exposure to EDCs in EU of €163 billion and in the US of $340 billion (addressing only a few substances and only a few diseases), the reports should be not only widely distributed to inform about the impact of EDCs on health and environment, but also updated. Additionally, other activities, such as the country case studies and the awareness raising campaings from the EDC work plan, have not been carried out, yet. This should be done urgently, as many people are affected by EDC-related diseases. SAICM is the only international forum to address this topic from a health and environment perspective. Dear Madame President, IPEN has been a member of UNEP Chemicals in Products Steering group since the very beginning. IPEN Participating Organizations (IPEN POs) work on collecting new data on chemicals in consumer products, increasing awareness and advocating for policy development and changes for reducing health and environmental risks from chemicals in products. Overall, IPEN’s goal is for health and safety information and the identity of hazardous chemicals in individual products to be publicly available throughout the entire product life-cycle, including during product manufacture, use, recycling and/or disposal. However the biggest challenge we face is that the private sector does not publicly disclose comprehensive information on chemicals of concern in products, chemicals which have adverse effects such as mutagenicity and carcinogenicity and adverse effects on the reproductive, developmental, endocrine, immune and nervous systems. The lack of information applies to a variety of products including children’s products and personal care products. Information on consumer product labels does not contain proper information about hazardous chemicals that are present. The industry does not typically provide comprehensive information on health effects and measures to reduce exposure. Since access to information on chemicals in products is limited, progress has been slow in fulfilling the CiP Programme Objectives. As I have noted, the lack of information applies to all categories of products. This is an area that requires greater industry responsibility and forward progress. The discrepancy and non-harmonized rules of information exchange on chemicals in products in various countries and regions justifies the need for disclosure of full health and safety information and the complete identity of toxic chemicals in individual constituent components of products prioritizing chemicals identified according to SAICM criteria. This information should be publicly available throughout the entire product life-cycle, including during product manufacture, use, recycling and disposal. Lack of a comprehensive, unified, open access, regularly updated on-line database to provide consumers with information about chemicals in products. The credibility of the CiP Programme is under threat as the private sector participants in the CiP Steering Group have not yet publicly endorse the CiP Programme and have not yet become members. To meet this challenge and to maintain the credibility of the Programme, this should happen before2020. The work with product manufacturers has not been that active noting that often consumer products do not contain proper labels with information about product manufacturers, and manufacturers are not willing to disclose information about the chemicals they use. To meet this challenge it is important that more stakeholders inside and outside the supply chain join the CiP Programme and ensure its implementation. To further meet these and other challenges IPEN continues raising public awareness on the hazards of chemicals, products and wastes and to promote precautionary action and informed choice. IPEN continues monitoring chemicals of concern in consumer products in developing countries and countries with economies in transition and make the results publicly available. We will campaign for the full implementation of the Chemicals in Products Programme with actions on timely toxic alerts covering hazards in certain chemicals and products to meet consumer demands for information, to enable decision-making, as well as induce governments and industry to take action. Thank you.